Life Before the Dinosaurs: Helicoplacus. Helicoplacus was a peculiar Cambrian echinoderm that was about seven centimeters long. When Helicoplacus was alive it was in an upright position, either anchored to the sea floor or floating in the water column. The location of its mouth is highly disputed, but scientists do know how it fed. It had a spiral groove around the sides of its body that led to the mouth. This would allow food to go along the groove into the mouth. 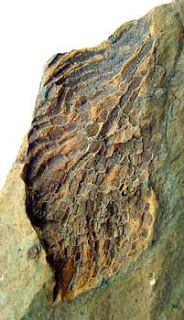 Helicoplacus is the earliest well-preserved echinoderm. It may have resembled a miniature water tower or a pinecone. Helicoplacus means "spiral plate," because of its spiral groove and its armored body. Fossils of Helicoplacus have been found in California. Helicoplacoids like Helicaplacus did not live for a very long time, and did not survive past the early Cambrian. Helicoplacus was probably an extremely primitive echinoderm. It didn't have five-fold symmetry like most echinoderms do, and it had a primitive way of feeding and also a very early respiratory system.